Does your car dry before you can wipe it down? Getting water spots? Have a black car? The "Secret" Is Out! Never hand dry your vehicle again. Now washing and "AIR DRYING" your vehicle, boat, RV or aircraft couldn't be any easier with the best portable water deionizer available today. Imagine never having to hand dry your vehicle, RV, boat, or aircraft again. 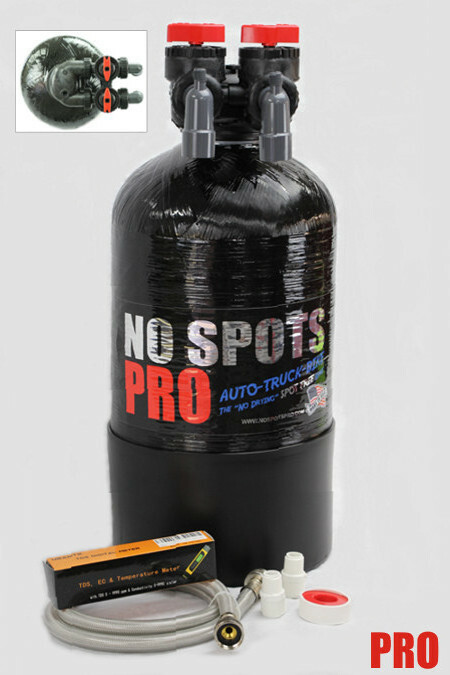 The No Spots PRO de-inonized water generator is the "secret" that detailers, car washes, and others use to achieve professional results. Keep your vehicle, boat, RV or aircraft looking great and make it easier to keep it that way. You will enjoy washing and NOT drying your vehicle again. Our de-ionizing system takes out all of the minerals in your water so you can just wash, rinse and let your vehicle "Air Dry"
Bypass Valve Equipped, leave your hose hooked up and use tap water if desired. The Best No Spot "AIR DRY" Water De-Ionizing Rinse Available! High tech science, but deceptively simple. 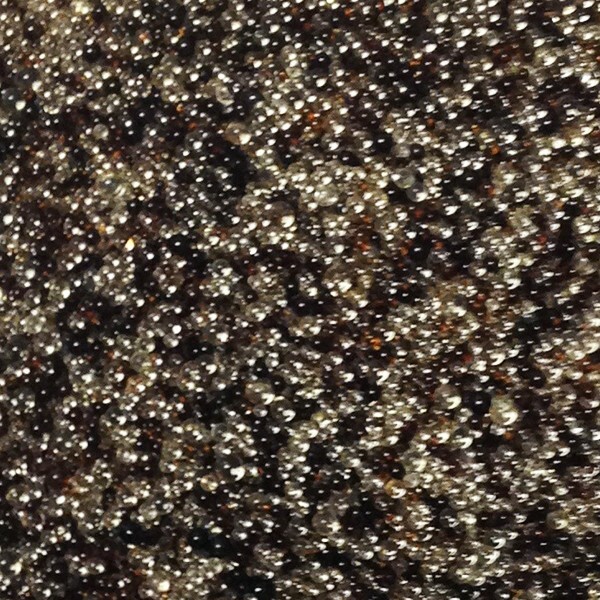 The No Spots PRO uses ion resins and processes to remove hardness from water by removing calcium and magnesium ions (the stuff that causes water spots on your vehicle) an ion-exchange column. The magnesium and calcium ions migrate out of solution to the active sites on the resin. Cations are replaced with hydrogen ions using cation-exchange resins; anions are replaced with hydroxyls using anion-exchange resins. The hydrogen ions and hydroxyls recombine, producing water molecules. Thus, no ions (water spot causing) remain in the produced water. 200 Gallons based on average input water Total Dissolved Solids (TDS) level of 100-200 ppm. It takes approximately 3-5 gals to rinse a car and 10-20 gals to rinse an RV. Aircraft and boats are size dependent. 400 ppm = 100 gallons - What, are you pouring concrete? We do include an electronic TDS tester to measure your input water. We recommend the PRO XL for RV's, boats and aircraft as it has double the initial capacity of the PRO model. So easy to use, hook up your garden hose and go. We even have a bypass valve so you can use regular tap water without having to change your hoses or setup. Enjoy not having to dry your vehicle ever again with the best portable water deionizer available today. American sourced and made. Keep Americans employed and enjoy quality American made products. Your new No Spots Pro or Pro XL comes with a 5-Year Limited Warranty. Let's see others beat that. No worries ever! YES!, 100% Money back guarantee. If you don't like it your No Spots Pro, just ship it back in new condition, and we will refund 100% of your purchase price. In addition to vehicles, boats or aircraft, how about your windows at your home or business? Wash them, rinse with No Spots Pro and done. Result, spot free windows with little effort. You can be using your No Spots Pro or Pro XL with 5 minutes of receiving it. Nothing else to buy or go to the hardware store for. Everything you need is included. READY TO USE, NOTHING ELSE TO BUY! Same great results as the No Spots Pro, but is a basic package and does NOT included the valved bypass head, or TDS meter as shown in the image above. Just hook your hose up and go! YES! I want the No Spots Pro "Basic"
11 pounds of of our De-Ionizing resin that utilizes a dark colored cation resin and a light colored anion resin and is designed to produce very high water quality. The best DI resin there is, bar none! The life of the resin depends upon the amount of total dissolved solids (TDS) in your water. Easy to install, safe and disposable! Great product and easy to use and setup. My water went from 120-180 ppm to 0! The only complaint I have is that I didn't buy this sooner. This is a wonderful product. Easy to install and maintain. Great product and easy to use and setup, including recharging the system. Super easy hook up and everything needed is included. Simple, easy to use and light weight! No more hard water stains on the boat while washing in the sun. Worked perfectly. Simple easy to use installation with good instructions. © 2018 Miracle Gas Inc. All Rights Reserved.